Subaru has already introduced the XV variant of the current-gen Impreza, which is Subaru's idea of a compact SUV, and with the next-gen model around the corner, an Impreza XV successor will also be introduced. 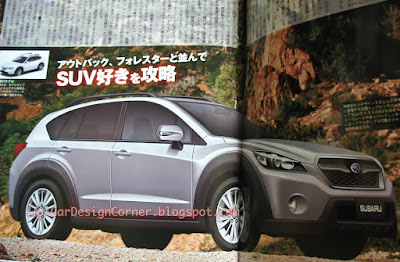 This is a rendering published by Mag-X and according to the article, the new Impreza-based SUV will be introduced in January 2013. In the U.S. this would be the Outback Sport and have 2 different paint tones. So far, I'm really liking these illustrations of the all new Impreza and hope they keep the price they same with better interior materials for a more pleasing environment. They know the Koreans are a huge threat and people have complained big time about their current generation models. I should have some on hand photo at the NY auto show. Nice, I hope that the new car will get it's own name and body, and will be more then a taller Impreza with some black plastic in the lower side.